So right at the introductory level we have people on all sides who can neither define nor […] understand what energy, heat, and temperature actually are. I won’t define them for you right now but at least you have the textbook quote to cite that they are indeed not at all the same thing! This confusion about thermodynamic things is par for the course of climate alarmism, its bread and butter. We’re discussing nature and the way its physics works, and it seems to me that nature doesn’t behave half one way plus another, but quite precisely according to physics and hence mathematics. There is nothing more precise than the behaviour of nature and mathematics and therefore there is nothing more important than their semantics. So, “purely arguing about semantics” is precisely what we’re supposed to do with physics, because this is what gives us understanding of anything about it in the first place. In short: If we don’t go by the correct, agreed-upon term or definition for any specific physical phenomenon or process that we want to describe and explain, then this will ultimately prevent us from understanding what that physical phenomenon really is and how that physical process really works. We will end up confusing ourselves and/or the people we’re trying to communicate with. What we say and write about things affects the way we THINK about them. Most people actually walk around thinking the atmosphere directly warms/heats the surface, in the exact same way the Sun does. That the solar input can only warm it up to a point, and that the atmospheric input is specifically needed to warm it the final stretch, beyond the solar reach, so to say, up to the average temperature as observed. They simply do not get the fundamental distinction between how the Sun works and how the atmosphere works. Picture the atmosphere over a long period of time (like a decade), and for the whole globe. If it hasn’t heated up or cooled down we know that the energy in must equal energy out (or if it has only done so only marginally then energy in is almost equal to energy out). This is the first law of thermodynamics – energy is conserved. What energy comes into the atmosphere? How does the atmosphere lose energy? Thermodynamics 101: The atmosphere does not lose energy by radiating downwards to the surface. This would only happen if the surface were colder than the atmosphere. Or in a hypothetical situation where the surface is warmer, but still somehow doesn’t radiate to the atmosphere at the same time as the atmosphere radiates to it. The atmosphere – on average – only loses energy by radiating to SPACE. It cannot lose energy in any other direction. Because all regions surrounding the atmosphere other than space are – on average – at a higher temperature than the atmosphere. And so the atmosphere will always only gain energy from its thermal interaction with these other regions. A loss of energy from a thermodynamic system is when, between t0 and t1, its U has decreased, normally associated with an absolute drop in the system’s temperature T (never with a rise). Likewise, a gain of energy to a thermodynamic system is when, between t0 and t1, its U has increased, normally associated with an absolute rise in the system’s temperature T (never with a drop). Yes, that system can indeed lose and gain energy at the same time, and there will be a net loss or a net gain of (internal) energy [U] and a corresponding drop or fall in temperature [T] as a result. But such a simultaneous loss and gain of energy from/to a thermodynamic system resulting in a net change in its U (and T) are – by thermodynamic definition – never part of the same heat transfer. The system can only lose OR gain energy inside ONE specific thermal interaction. Case in point: The surface of the Earth takes part in TWO heat transfers at the same time: 1) Sun → Sfc, and 2) Sfc → Atm/Space. It always gains energy from the first transfer (its Qin (heat input)), just as it always loses energy through the second (its Qout (heat output)). There is never any gain in energy for the surface, no rise in its U (and thus no rise in its T), resulting from the second transfer specifically, from the average thermal interaction between the surface and the atmosphere/space. The Sun is its “hot reservoir” (heat source) and the atmosphere/space are its “cold reservoir” (heat sink). Figure 1. 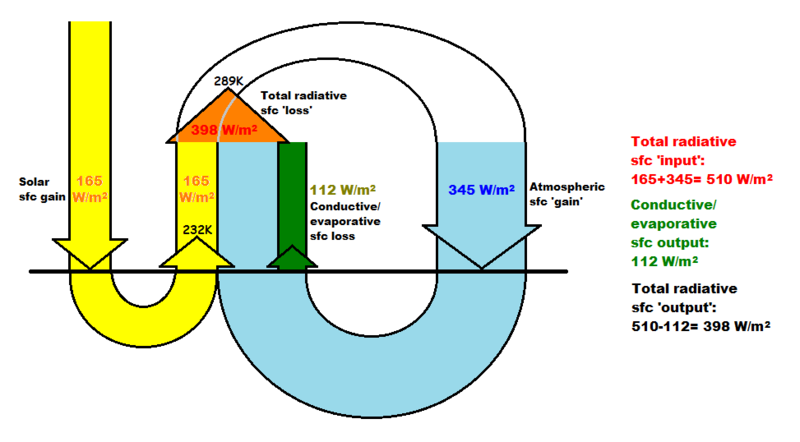 The surface radiative budget does NOT look like this: IN, 188+345 = +533 W/m2; OUT, -23+(-398) = -421 W/m2. Only “Climate Science” would propose such ridiculousness. It looks rather like this: IN, 188–23 = +165 W/m2; OUT, 345–398 = -53 W/m2. 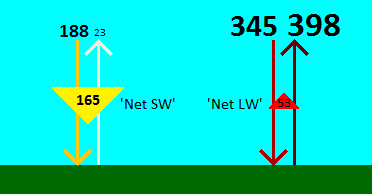 The +165 W/m2 is the Sfc Qin(sw), the -53 W/m2 is the Sfc Qout(lw), the Sfc Qnet(rad) = 165–53 = +112 W/m2. Two separate heat transfers. This entry was posted in Energy transfer, Greenhouse Effect? and tagged energy gain, energy loss, heat, heat transfer, internal energy, Joseph Postma, laws of thermodynamics, Science of Doom, temperature, thermodynamic system. The saddest thing about this whole thing is that this is far from new knowledge. It’s been known for a long time. But is this relationship (IR absorbance + great light path length (l) → significant heat transfer impedance (→ warming)) really valid also in our atmosphere? THAT is the big question. And it turns out that there is no real reason to assume this to be the case. In fact, from consistent empirical observations, whenever you increase the thickness of an air layer beyond some threshold, all you do is reduce any radiative effects on heat transfer (thus, indirectly, on surface temperatures), pretty soon to naught, by letting convection become operative. Not ‘reduced somewhat’. This is not merely a ‘negative feedback’. It’s NEGATED. Beyond the convective threshold, convection controls all heat transfer up through the air column. Or in terms of regions, tropics which has sunlight closer to zenith, atmosphere absorbs less, and regions closer to poles where sunlight has to go thru more atmosphere [most of time further from zenith], the atmosphere absorbs more of the sunlight. And of course atmosphere includes any clouds. And in terms IR emitted from surface, most of IR is going thru more atmosphere- doesn’t matter where [tropics or pole ward]. Though in all cases I don’t think atmospheric gases absorbs much radiant energy of any kind and atmosphere is more significant in terms scattering/diffusing/reflecting light rather than absorbing it. I fear RWturner is all wrong. As I’ve pointed out on numerous occasions, both here on this blog and other places, what violates the 2nd Law isn’t the idea that the atmosphere insulates the solar-heated surface of the Earth per se. Our massive atmosphere does insulate the solar-heated surface. And the simple physical phenomenon of “insulation” doesn’t violate the 2nd Law of Thermodynamics in any way. As long as you’re aware of the fact that neither of the two hemifluxes are themselves HEAT fluxes, that they only make up a heat flux between them, and that this heat flux specifically constitutes the radiative heat LOSS of the surface, then you’ll naturally understand how they must ALWAYS, in any thermodynamic analysis, stick tightly together, kept within the same bracket, both on the LOSS side of the surface budget. And as long as you do it like this, then you’ll be perfectly fine – no 2nd Law violation. Split them apart, however, and treat them as if they were individual, independent thermodynamic quantities, placing each of them right beside actual HEAT fluxes, and expecting them to produce the exact same kind of macroscopic (thermodynamic) net effect as these do, then you’ll end up confused and in trouble. The Laws of Thermodynamics simply do not allow such an operation, which MATHEMATICALLY seems perfectly reasonable, but which is in strict violation of fundamental physical principles. Imagine you have your hand stretched out with the open palm facing up. In your palm lie two dimes/pennies. A person is standing right in front of your outstretched hand, holding a single dime. In this situation, you represent the surface, the person in front of you represents the atmosphere, and the dimes represent photons. Now here’s what happens: The person holding the single dime places it in your palm with his one hand at the very same moment as he grabs the two dimes that were there already with the other, removing them from your hand. That is, he performs these two separate operations simultaneously. The question then becomes: Did you ever have THREE dimes in your hand during this exchange? The answer is of course “No”. First you had TWO. Then you had ONE. And that’s it. The first of the original two was simply exchanged with another one, while the second was lost. People, however, have this instinctive, almost monomaniacal tendency – I would almost call it ‘urge’ – to look at and interpret ONE of these operations (‘events’) at a time, and to just adamantly stick to that approach, an approach that is fundamentally mathematical rather than physical in both origin and application. It basically derives from how our human mind works. It always seeks order and simplicity even when and where there is none to be found. And it does so for a very simple reason: To get a grasp of how things really work. You need to pick the clock apart in order to understand what makes it tick. That is, start by breaking things down into their most basic, irreducible constituents and then work your way up from there. And this has of course turned out to be an exceedingly successful method for gaining knowledge. It has served us well. And still does. However, it CAN also be misapplied. We should be careful not to follow it blindly. Sometimes our mental compartmentalisation process goes too far. We end up “seeing” things (and/or potential connections between things) that aren’t really … real; or meaningful, or relevant to what we’re actually trying to get a grasp of. And so we end up confusing ourselves instead. Mostly regarding “cause and effect”. In this case, conflating specific phenomena of the MICRO and MACRO realms is the pitfall to beware. Invoking a distinctly QUANTUM MECHANICAL quantity and/or process to justify or explain an inherently THERMODYNAMIC effect is simply profoundly misunderstood … And people just don’t seem to get exactly HOW misunderstood it really is. What most people do is simply analysing the effect of each operation (‘event’) in the analogy above IN ISOLATION from the other one, in fact from everything else. They estimate its effect AS IF the other (opposing) one didn’t happen at the exact same time. They only regard the photon absorption and “forget” or “ignore” the simultaneous (and larger) photon emission. Such a narrow scope doesn’t work if you want to discuss THERMODYNAMIC effects. Then you will only fool yourself into thinking that we’re dealing with two SEPARATE thermodynamic processes in one. We’re not. There aren’t. There is just the one. The one instantaneous exchange. #2 the MACROscopic (thermodynamical) perspective. Both are in a sense ‘real’, but they address very different aspects of ‘reality’. What people tend to do is mix them up, or rather somehow merge them into one and the same perspective. And that’s where the confusion arises. It is claimed (or at least very much implied) that the atmosphere (the person originally holding the single dime) ADDS energy to the surface (the palm of your outstreched hand). However, this is only correct in the MICROscopic perspective, that is, IF – and only if – we choose to follow ONE particular photon (dime) through the exchange and ignore the other two; that is, the photon/dime originally held by the person in front of you, coming IN from ‘the atmosphere’. THAT individual photon (and the energy it carries) is indeed ADDED to the surface in this exchange. But as I pointed out above, this circumstance isn’t “meaningful, or relevant to what we’re actually trying to get a grasp of”. Which is whether or not ‘energy’ (in the generic sense, not one particular quantum of energy) was added from the atmosphere to the surface during the exchange. The MACROscopic perspective. What they do is “Invoking a distinctly QUANTUM MECHANICAL quantity and/or process to justify or explain an inherently THERMODYNAMIC (thermal) effect”. Did the atmosphere ADD energy equivalent to the energy of a single photon to the surface during the exchange? No. It added one PARTICULAR photon, yes, but it removed two OTHER photons at the exact same time. From the very same surface. Your hand. So what ACTUALLY happened? The energy associated with one of the two photons/dimes that you held in your hand originally was simply EXCHANGED with the energy associated with the one photon/dime originally held by the ‘atmosphere’ person in front of you. The other one was lost (removed by the ‘atmosphere’ person), without compensation. And so, the NET effect – the THERMODYNAMIC (macroscopic) effect – of the thermal radiative exchange between sfc and atm is that the atmosphere doesn’t add ANY energy at all to the surface (zero dimes), while the surface gives IT some energy (one dime), but LESS energy than it would’ve handed to space in the same situation (two dimes). “Insulation” is still the consequence of back-radiation though? Mmm, no. Apparent “back radiation” is a consequence of “insulation”, that is, of tropospheric temperature. Good article on earth’s energy budget, and how the warmists get it wrong. The macroscopic, thermal effect as you call it, is not fundamental. The non-fundamental nature is understood by noting that entropy can not be defined when a system is far from equilibrium. Hence, temperature can not be defined since the definition of temperature is directly linked to the response in entropy with change of internal energy (The definition is nicely introduced in Schroeders elementary textbook that you mention). Radiative energy transfer between bodies at close proximity is one instance where the equilibrium description breaks down completely. It is necessary to use a full quantum mechanical description in such a case. Since photons are bosons it is also necessary to describe them as a quantum field, not as isolated particles that you can count (different observers disagree on the number of photons in a process). A quantum mechanical description is always valid, in principle, although not usually practical when an effective model can be used instead (thermodynamics). Thermodynamics is the study of systems in equilibrium. Some situations where the systems are out of equilibrium can still be treated with thermodynamics. But a more complete picture is given within transport theory which is considered to be an advanced topic. Daniel Schroeders book on thermal physics has a short section touching upon this, even though the main focus of that textbook is on thermodynamics. None the less. Thermodynamics is not the best suited theory to treat radiative energy transfer. One thing that caught my eye was the idea that insulation is a thermodynamic process. First of all, shouldn’t insulation be called a material or matter property, not a process. A process indicates transformation. Insulation just indicates resistance to energy transfer, that is the inverse to thermal conductivity which is the material parameter in Fourier’s law. Secondly, this property, insulation, is more related to kinetics than thermodynamics, in the case of energy transport through gasses.